The European Tour’s Middle Eastern swing concludes this week with the Omega Dubai Desert Classic at the Emirates Golf Club. Stephen Gallacher of Scotland defends the title. After excellent tournaments in Abu Dhabi and Qatar, the line-up of star names in Dubai means this event should provide a great finale to the European Tour’s three weeks in the Gulf. Tiger Woods is on the start list, so too Rory McIlroy, Henrik Stenson and Ernie Els. This will be the 25th running of the Dubai Desert Classic and the list of past winners is impressive – Seve Ballesteros, Ernie Els, Fred Couples, Colin Montgomerie, Jose Maria Olazabal and Tiger Woods have all lifted the trophy. Last season, Stephen Gallacher of Scotland opened with a 63 and added a Saturday 62 en-route to a three-stroke victory over Richard Sterne. England’s Barry Lane will be the only player in the field this week to have competed in each of the 25 editions of the Dubai Desert Classic. The Majlis Course at the Emirates Club was the first all-grass layout in the Gulf and it’s still recognised as one of the finest tracks in the Middle East. Travelling through the desert dunes, fairways pass seven lakes, desert areas, indigenous flora and the “Majlis” themselves. Arabic for meeting place, these tent-like structures are a distinctive feature sitting between the 8th and 9th holes. Rafa Cabrera Bello – The 2012 champion played some excellent golf last week in Qatar and finished tied third. He was tied fourth in Abu Dhabi the week before. If he can keep the form going, and put four solid rounds together, this could be his week. 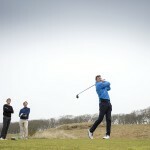 Thorbjorn Olesen – After a slightly disappointing 2013, the Dane is showing a return to form at the start of this year. He was tied third last week in Qatar. He was also tied third in this event last year. Tommy Fleetwood – He’s being tipped by many to have a great season and he was tied third in the Volvo Golf Champions at the start of January. He also finished in the top-10 in this event last year. Against a high-quality field, this could be the place for Fleetwood to take a step-up. Key hole: 9th. At 463 yards it’s one of the longest par-4s on the course. Add the complication of the water waiting all down the left side to an awkwardly shaped green and you have a real brute. Skills required: Course management. There are a number of water hazards and bunkers to contend with as well as desert areas around the Majlis course. The winner will plot his way round employing a blend of power and accuracy.